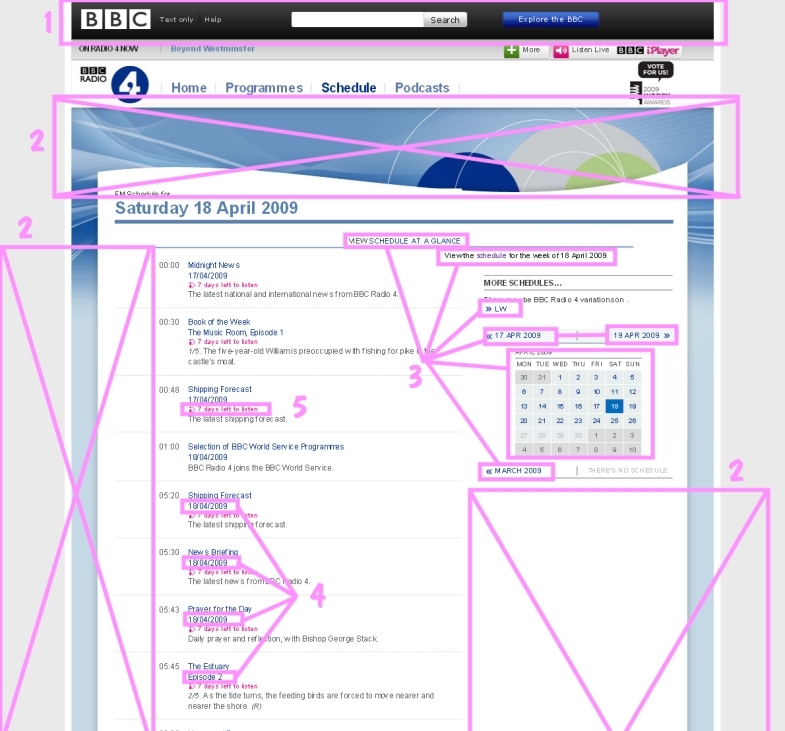 You don't have to put up with the BBC's awfully designed radio schedule pages any longer. And you can mark programmes and series you want to listen to. And you can jump to other stations with a single click. Do you lose the will to live while scrolling down? Compare these two versions to the same scale. Do you get frustrated by lack of useability? Whilst "Search R4" might be useful this should go at the bottom"
News readers don't leave long pauses between each word so why is there so much wasted space on the web pages? More information about schedules scattered around higgldy-piggeldy. On a long page perhaps the calendar should be shown in a long column rather than blight one third of the page with wasted space beneath. Listen again takes up more precious vertical space. The useful information is spread all over the place and hidden in the camouflage. 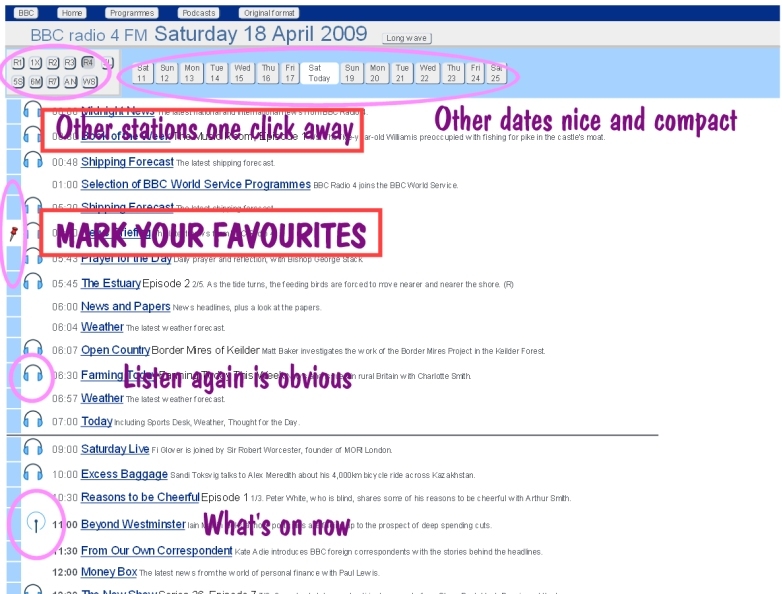 People want to look at what's on their other favourite stations as well. Compact jump-elsewhere buttons on the top row. When browsing the schedule, a week ahead and past at a time is enough for most people. The programme titles are the most important things. Let's make them stand out (And put the whole page in larger text for easier reading.) - How simple. A compact headphones icon indicates listen again and the animated aerial indicates listen now. What do people want to do lots of with schedules... ...Read them ahead of time and mark things of interest. Such an obvious need so let's do it. - How useful. Now go to www.bbc.co.uk/radio4/schedule/ (New window) You should see my version of the Radio 4 schedule where you can get at everything with just a single press of the Page Down key. Click on the Original Format button to see what you've just escaped from. Now click the back button to return to the new format. Clicking on the R7 button takes you to Radio 7. Clicking on gives listen again and clicking on gives listen-now. 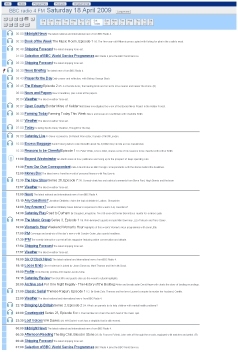 Keep clicking on the pins to change colour or delete. The first release was 21st April and is developing. It works by downloading the BBC's web page but before displaying it strips out everything except the useful data and reformats it.